Hello, it's the final day of the Newton's Nook Designs Launch Party! The last set left to reveal is Campfire Tails. This is a fun set with great camping images. Check out the Newton's Nook Blog for complete reveal of all images in this set. I did a lot of copic coloring and fussy cutting on this card. The blue sky and brown earth are blended distress inks and the sentiment is stamped with silver pigment ink to shimmer like the moon and stars. Would you like to win Campfire Tails? 1. Comment on Newton's Nook Design blog: http://www.newtonsnookblog.com. One Winner will be randomly chosen from the comments on the launch party posts. 2. Comment on the Design Team Member and Guest blogs (see list below)! One winner will be chosen at random from the collective blogs in the Launch Party. Make sure to check out each of their blogs and comment for your chance to win. You will not know which blog has been chosen so the more you comment on the better your chances are of winning! You have until Thursday, July 18th at 9 pm Central Standard Time to comment -- winners will be announced on the blog post on Friday July 19th. All new stamp sets will be available for purchase on the Newton's Nook Designs website on Friday July 19th. Your coloring is awesome, again. Such a cute card Chari! very cute. Love the fire popped up! the shimmer is just perfect here! Love the night scene and dimension, cute card!! so, so darling! Love the glittery moon! 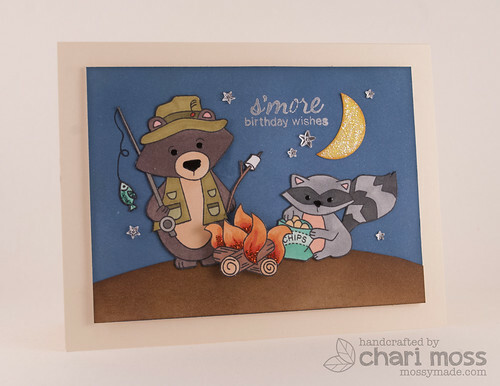 Such a sweet scene you created here Chari! I love the sparkle you added to the campfire! Adorable scene and wonderful use of so many images from this great set! sweet card!! I love it!! So cute. The critters are sharing and sending s'more birthday wishes. Thanks for sharing. Ambitious card with all that fussy cutting (when will dies be available???) but what a great payoff! Excellent card. What an amazing card and I can tell you put lots of time and effort into it. It sure is adorable and sure to bring pleasure to whonever is on the receiving end! Oh this card is just tooo stinkin' cute! Oh my, this is probably my favorite set this week and this cute little scene is the reason why! Love your card! This is just plain adorable. What a lot of work you've done. Wow! Fabulous card! Love the adorable scene you created! This campfire scene is so adorable! I love the way you made a night sky! Oh, what a fantastic scene you have created with the stars and that moon. I love this card! WOW, Chari! What a darling scene you've created! So many perfect details!! I especially love all of the touches of sparkle!!! And those critters are super duper cute! Awww, this just makes me want to be camping with these cute little guys! What a wonderful card! So many details in your card! Thank you for sharing! Cool card. They really need that campfire on a crisp starry night. Love it. Oh wow! That card looks like a page out of a children's book. Absolutely stunning. What a cute card and stamp set. Thanks for sharing.